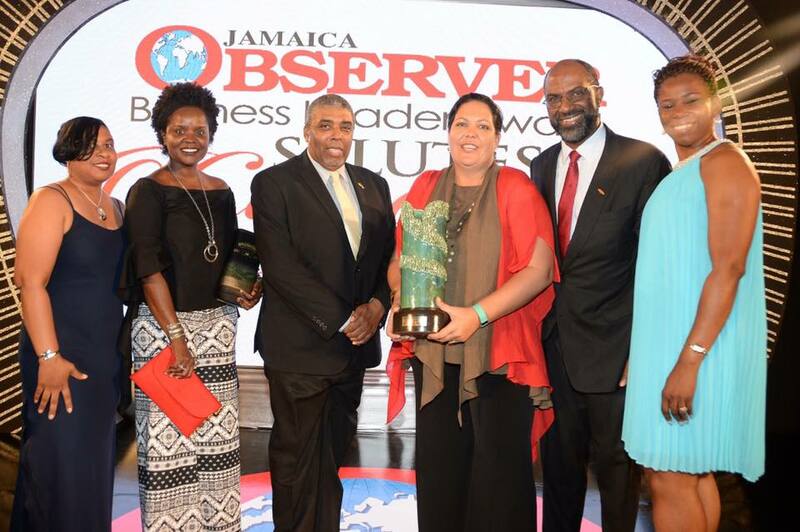 Saffrey Brown (third from left), then general manager of the JN Foundation, accepts the award on behalf of The Jamaica National Group for its selection as one of The Jamaica Observer’s Business Leader Awards’ Nominees in the area of Corporate Philanthropy. Joining her from left to right are: Andrea Martin, manager, procurement and administration, JN Bank; Dr Renee Rattray, senior manager, learning development and culture, JN Group; Leon Mitchell, chief, marketing and sales, JN Group; Earl Jarrett, CEO, JN Group and Marie Stewart Lewin, senior manager, JN Group. 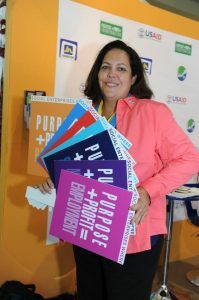 At the age of eight, Saffrey Brown, former general manager of the JN Foundation, was thrust into advocacy and volunteerism while living in Trinidad and Tobago. “The first time I protested, I was eight years old. My mother had me outside this old historical structure called the ‘George Brown House,’ and my placard read: ‘Honk your horn if you want to save this house.‘ Every day, after school, I would be out there protesting and we did save that house,” she chuckled. The “George Brown House” was the centre of controversy in Trinidad and Tobago when plans were made for its demolition in 1985 to make way for a new office complex. This led to the “George Brown Uprising,” and, as a result of public outcry, the house was saved and subsequently restored. For Saffrey Brown, the campaign sparked a passion, which influenced her to dedicate her career to advocacy and assisting the disenfranchised. She also indicated that her ambition was further cemented at age 15, when her community in St. Ann, Trinidad and Tobago was flooded, resulting in the death of a few persons in her hometown. “I remember spending weeks teaching community members about the dangers of living on the embankment of rivers. I was studying geography at the CXC level, and wanted to educate them about flood-prone areas. That was where my independent volunteerism started,” she related. Therefore, after graduating from The University of the West Indies, Mona, she sought to immerse herself in development work. She landed a job at the Kingston Restoration Company (KRC), where she worked on remedial educational projects for children living in the inner-city of Southside; and the Urban Renewal Trust Fund, provided a grant to assist persons living in those communities. She also championed “Tools for Development,” a project led by KRC, in collaboration with the then Jamaica National Building Society (JNBS) and The Gleaner Company Limited, which sought to put tools and equipment into the hands of inner-city entrepreneurs. Among the projects Saffrey Brown is most proud of is the Social Enterprise Boost Initiative (SEBI) of which she was the chief architect. The initiative has raised awareness of the value and importance of social enterprise to the economy and to position it as a viable business model and sector of growth. “It was a great project. But, I felt that professionally, things were moving too quickly, and that I needed a foundation of learning and experience. Therefore, I left Jamaica to live in England and worked there for a few years,” she informed. While working in England, she discovered the social enterprise model; and worked on several projects in that context. However, she became disenchanted. “I found that I was not passionate about the people I was serving and, I was becoming slightly resentful about the amount of money that was available for development in London. I thought about what we could accomplish if we had those sums of money back in the West Indies. While I acquired technical knowledge, the passion was beginning to fade; and, I knew that it was time to leave, so I moved back to Jamaica,” she related. On her return, she was invited by Earl Jarrett, then managing director of the Jamaica National Building Society (JNBS) to work on an inner-city project in which she designed the first JN Source Centre, in August Town. She was later appointed general manager of the JN Foundation and for the next decade, spearheaded and introduced a series of projects which steadily emerged and impacted the lives of many Jamaicans, particularly young people, in communities across the country. These projects included: The JN Resolution Project, in which high school students in rural Jamaica were introduced to photography and the opportunity that it presented them to address issues affecting their communities; the Financial Literacy Project – Be Wi$e and the Social Enterprise Boost Initiative (SEBI), among others. For Miss Brown, the jewel of all those projects was the creation of the Social Enterprise Model through The Source and SEBI. “Being the architect of the social enterprise movement in Jamaica is something that I’m extremely proud about,” she said. 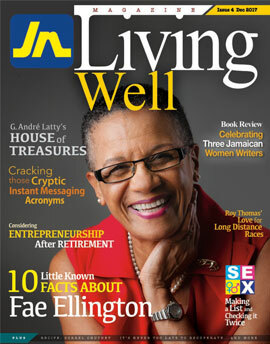 Ms Brown credits the success of her work at the JN Foundation to Earl Jarrett, chief executive officer of The Jamaica National Group, who is her mentor. “I have had an amazing 10 years working with Mr Jarrett, who was the chairman of the JN Foundation and my mentor. Having him and his vision in close proximity to the work I was doing, was a boost. It allowed me to see possibilities. His support when I attempted to implement things slightly ‘out of the box,’ and knowing that I had his support to go out there and test things, allowed me to be courageous,” she related. The daughter of the late Observer columnist, renowned poet and fiction writer, Wayne Brown, said that her parent’s upbringing was another factor which encouraged her to strive for excellence. “I come from a family of whom I’m proud. They are a family who added value to society. They are not just extractors, they give back, and are like the “bread and butter” of Caribbean folk. Being part of that family legacy is something of which I’m very proud,” she revealed. The mother of two boys, five and seven years-old, said that managing her workload and maintaining a family life would not have been possible without the support of her partner. “I have an amazing partner, who is an extremely supportive father, and provides a huge amount of support in that area. JN provides a balanced work life, so there is flexibility,” she said, pointing out that, having a family forces her to work efficiently. Ms Brown leaves the JN Foundation to establish her own business, and become a social entrepreneur. She has words of encouragement for women, urging them: not to limit themselves, but to be proud of who they are and pursue what they want to do.